When we welcomed Carver and Hollis into our family back in October, it was also the start of harvest on the farm. We owe a HUGE thanks to our parents, especially our moms for helping out during that time! My mom came and stayed for the first few weeks and then came back off and on for the next few to help me get through harvest. Not only was Kevin out in the combine a lot, but we would also have extra mouths to feed (uncles and other family members who were helping out that day), so having my mom and Kevin’s mom there definitely was a life saver! Also, never turn down food! That’s one that we were offered a lot right after the twins were born. Not having to figure out what to make for dinner was great! So thanks to all those who brought us a meal! We greatly appreciated it! We supplemented with formula not to long after the twins came home from the hospital and were on full formula by Christmas. But we were having issues with them being so extremely fussy, not liking to lay flat, spitting up a lot, and just acting uncomfortable. We tried switching formulas a few times and tried other bottles, we even tried some acid reflux medicine (which they hated). We finally settled on a new formula (Gerber GoodStart Gentle) with the Dr. Brown bottles that some good friend’s of ours lent to us (thank you Tony and Jane!). Once we got that figured out we seemed to have much happier babies! I’m not sure if it was their tummies, acid reflux, colic, or something else, but that was a crazy time. Every doctor appointment they continued to grow, but were still on the small size for their age due to being 3.5 weeks early. 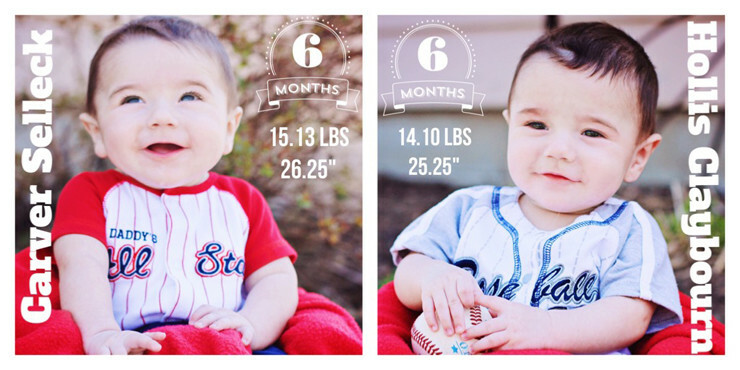 They seem to be wearing the same size clothes as their age in months, so they aren’t that little! It’s taken them a little longer to figure out things than their brothers, but Hudson was a week late and Ax was only one week early, so that’s to be expected. They started rolling over around five months and are close to sitting up on their own at six months. I think a few more weeks and they’ll have that accomplishment under their belts! 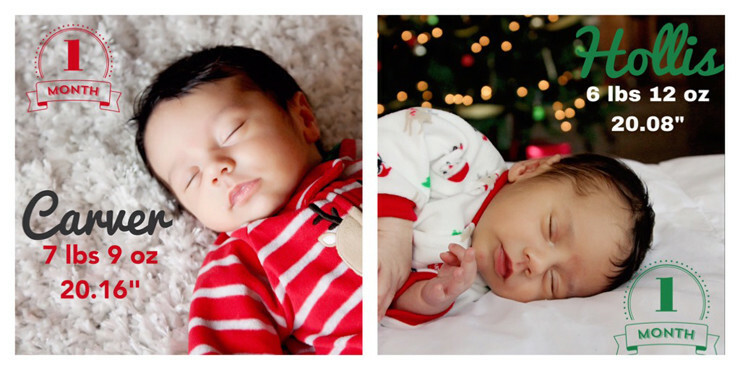 By three months they were sleeping in their own cribs. We were originally putting them in the same crib because they liked sleeping close to each other, but around three months they were starting to squirm around and would wake each other up, so into their own cribs they went. They were sleeping all night and only getting up once for a bottle. This was the turning point for me. I was finally getting sleep! I no longer had to nap during the day because I was up so much during the nights. This was amazing! I was starting to feel somewhat normal again and actually getting (some) things done! The first few months when I was so tired I would cry easily. I know Kevin was concerned about Postpartum Depression (we were told I had a higher chance of getting it since I had multiples), but looking back I know it was just from being so tired. That’s what I’d tell him at the time, but I don’t think he’d believe me. Either way, sleep is amazing! 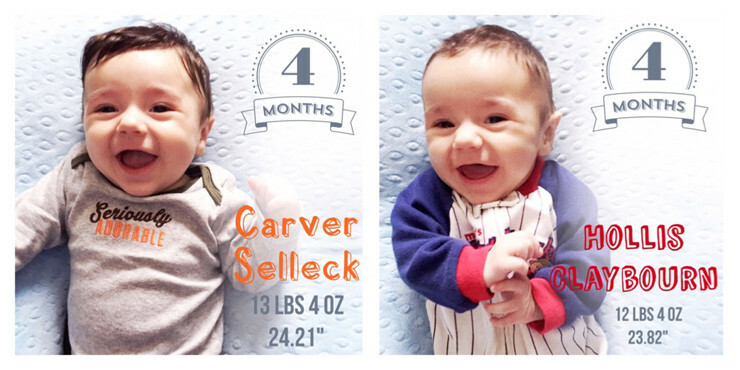 At 16 weeks Carver and Hollis got their first haircuts. Carver had curly hair, so I left his a little longer on top. This also helped everyone to tell them apart more easily. We never did get them mixed up or even worried about it after they were born. Before they were born I did worry about that. I even had my sisters bring some nail polish to the hospital. I was going to paint one of their toes blue and the other one’s gray before we left the hospital if they looked too much alike. Luckily we didn’t need to do that! 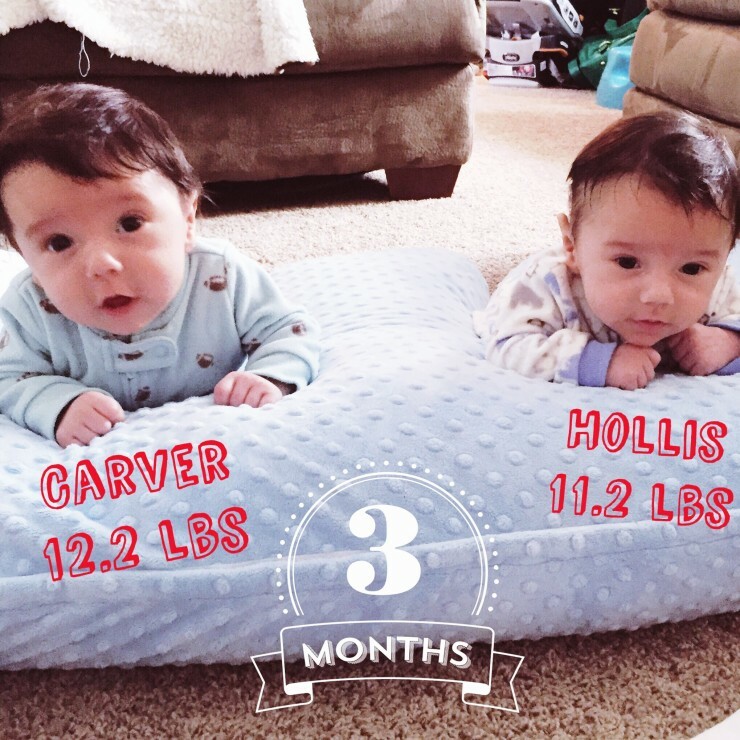 Carver had more hair and was heavier than Hollis. And now you can see that Hollis has a swirl for a cowlick in front and Carver’s goes straight back. 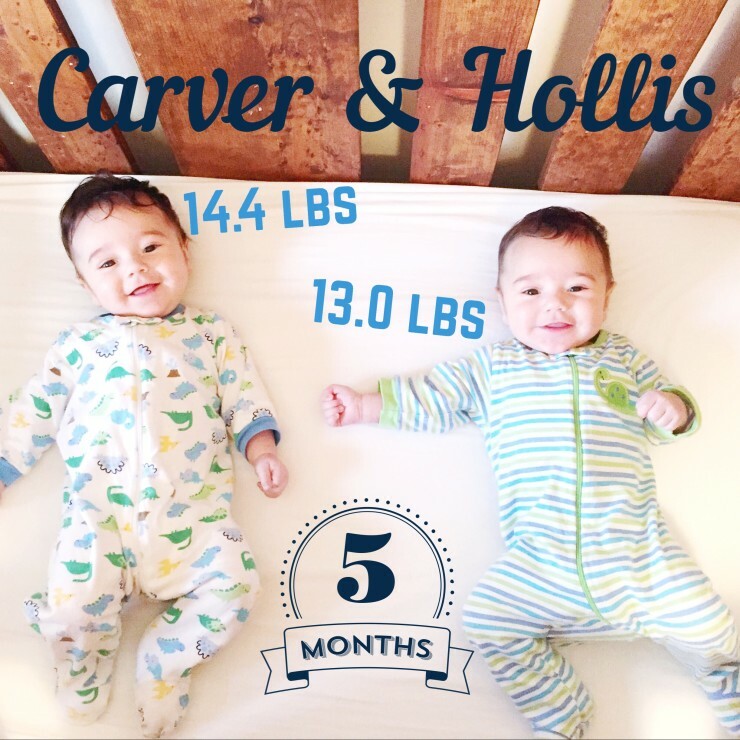 Carver is still bigger than Hollis now and if all else fails, Hollis has a little mole on the left side of his tummy. Everyone told me (even strangers walking past us) it will get easier. And it has! Looking back over the past six months we are definitely at an “easier” stage right now. They are both sleeping all night long (from between 8-9pm at night until around 7-8am the next morning). Hudson and Axten didn’t do that until 9 and 11 months old! So this is quite the blessing! We definitely have a schedule now. It goes something like this on a normal day: wake up at 7am, play for a little bit, drink bottle, play, nap around 9am, play and then eat lunch around noon, bottle and then early afternoon nap, then play some more, another bottle and late afternoon nap, play, eat dinner/bottle, play until they get fussy around 7:30-8pm, bathtime, bottle, bedtime around 8:30-9pm. Phew! They are such happy babies and are really fun right now. They are rolling around and can really move from the spot that you put them down at. They like sitting in their Bumbo seats and playing with their older brothers. They also really enjoy jumping in their jumpers that hang from the door frames. And probably their favorite thing right now is bathtime. They go from extreme fussiness to extreme happiness as soon as I turn that water on! It’s hilarious! We’ve also started on baby food, which Hollis really enjoys. Carver’s still not sure about it. So, looking back over the past six months, it has definitely gotten easier! 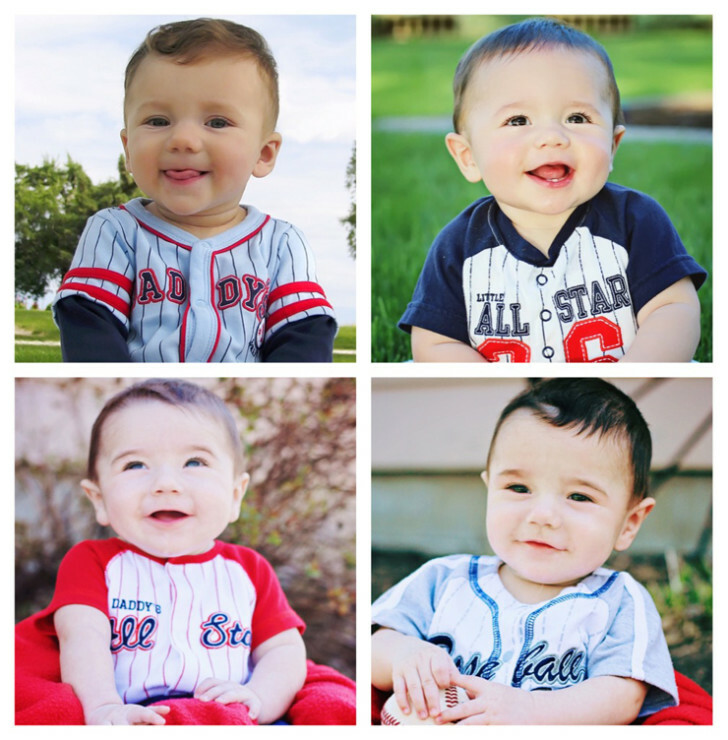 I still can’t believe we have four boys sometimes, we are extremely blessed! So that’s kind of a quick recap of the past six months. Starting with Hudson I always took their six month picture with a baseball outfit on so I took the twins outside the other day and snapped a few. You can definitely tell they are brothers, but each has their own distinct look. Hope you all have a great Friday and weekend! 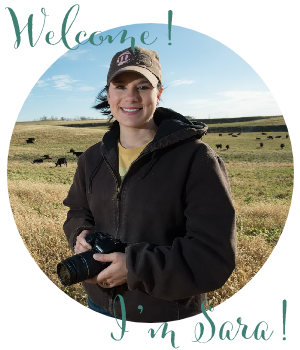 Follow along on social media (especially Instagram and Snapchat (saraross3907)) for fun updates on our family, the farm, and what I’m up to in the kitchen! They are incredibly adorable! 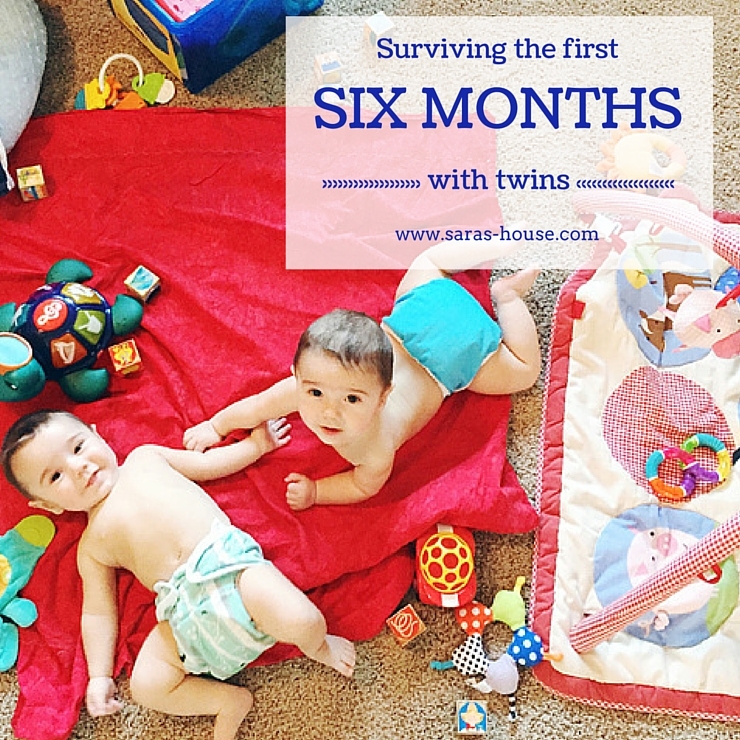 My SIL has fraternal twin boys who are 5 now…I don’t know how you twin mamas do it! What app do you use for their monthly stats? Love this post! I’m glad you are in a groove and that the twins are doing so well. As Baby #4 arrives in a month I’ll need to remember your trip of accepting help! They are so cute!!! You seem to have worked through all the stumbling blocks and survived and thrived! What a bunch of beautiful boys you have! I always wanted to be the mama of a bunch of boys, ended up with just 2, but I’m forever grateful for what I’ve got. And I love the names you’ve given all 4, they’re uncommon, yet classic at the same time. oh my goodness your kids are seriously adorable!! 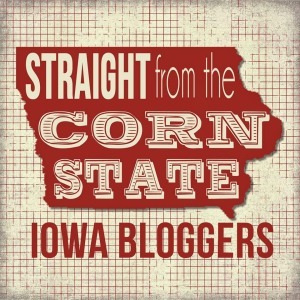 I love your idea of posting their monthly pictures with your blog! These are great tips for new moms expecting twins! Your boys and twin babies are so cute. What a happy family! One Chinese news report mentioned your farm. I saw Hudson and Axten’s pictures from your talk in China. 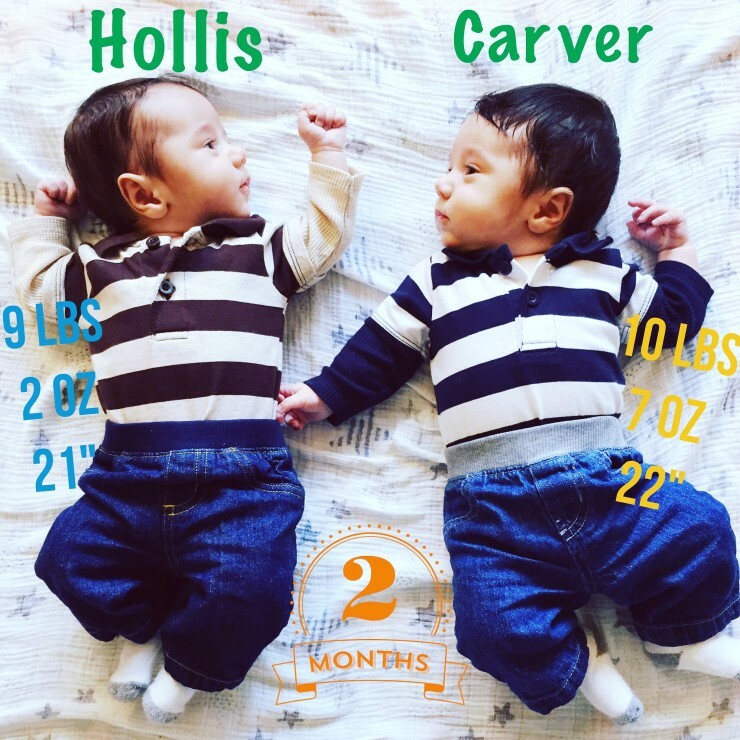 Happy to know you have two new family members (Carver and Hollis) and are doing pretty well! Thanks for your comment! Yes we are doing well! Hope to get back over to China and see you all again!